This is a fun game that will test the observation of your bridal shower party's guest. I have made beautiful game cards for this game in three different colors so that you can print the card in a color that matches the theme of your party the most. In order to save any image of games that I have made, click on the thumbnail, then a larger printable image will open up. Right click and save that image to your computer. You can easily take as many print outs as you like using your home printer. You can also print these games using a black and white printer but color will be more fun. 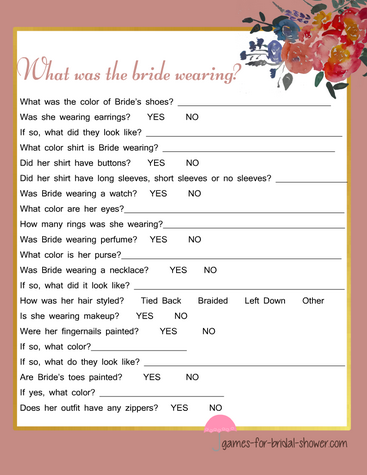 How to Play: In the middle of your bridal shower party, ask the Bride-to-be to leave the room for a while and distribute these game cards among your guests along with a pen or pencil. 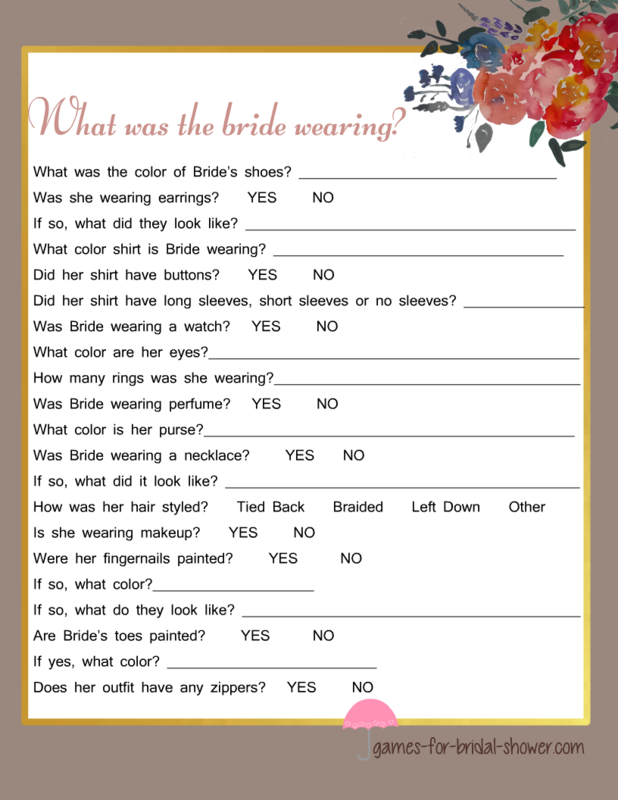 Ask the guests to answer the simple questioned mentioned on the cards about bride-to-be's dress and appearance. 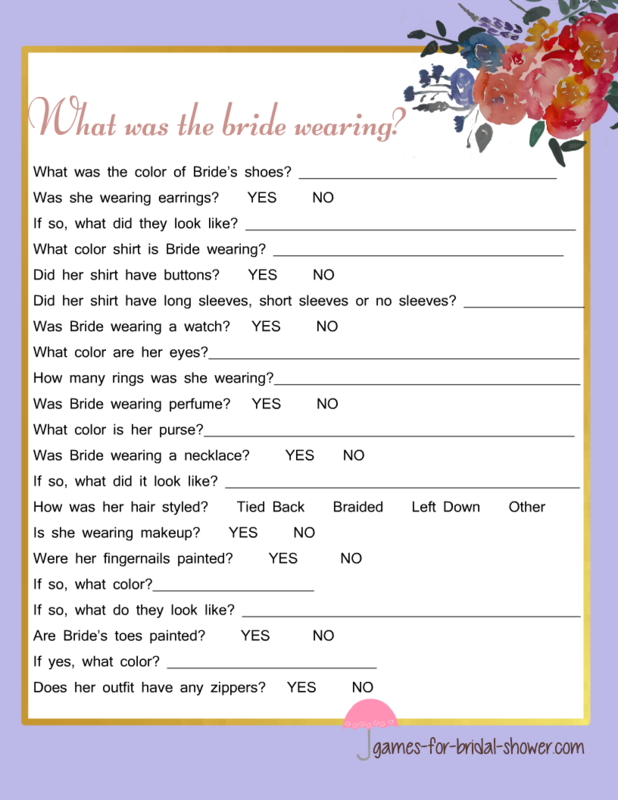 Then ask the bride-to-be to return to the room again and check the answers of the guests. The guest with most correct answers will be the winner. This is a free printable image for What was the Bride wearing Game in brown color. It is decorated with image of a beautiful bouquet. You can print this image if you think that brown is a perfect color for your bridal shower. 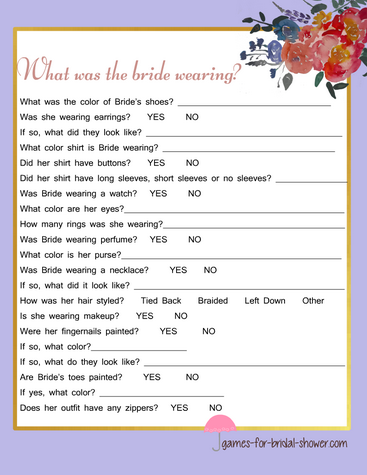 This is a free game card in lilac color that you will like to print if lilac is the color for your bridal shower party.